Winter still have Sweden in a very firm grip. I commute every day to Stockholm from the North Pole (Uppsala). It’s a trial. Every day is like a miniature polar expedition with cold, snow, poor road conditions and trains not running or running too late. 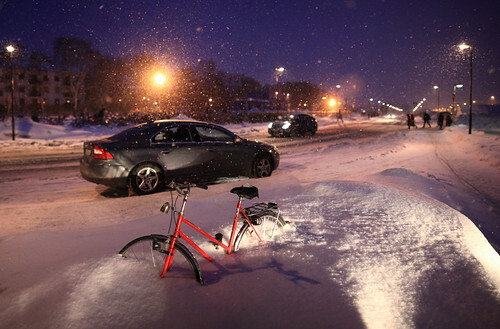 This image was taken last night (March 4) in a small but anoying snowstorm. Today it’s sunny and -10 degrees outside. Where’s spring? Use this image if you like it! It’s free to use under a Creative Commons – Attribution license (CC: BY). Please link back to the image Flickr page if you use the image on Internet.